Available supplied, installed and wired to the edge of our wide range of electric heaters for various industrial purposes, in any application in air, gas or fluid immersion, or provided separately to our customers according to the specific needs of thermoregulation thermal processes data , we provide various temperature control devices and temperature control, often necessary to preserve the electric heater from overheating and premature damage. The thermostat is an instrument that detects the temperature of a fluid, air or gas and adjust it according to specific process requirements. Often, this device is adopted in order to avoid overheating of the resistance on which it is installed to prevent damage. In general, the thermostat is a useful tool to detect and adjust the temperature of the room in which the same is located. The thermostats, in fact, can be installed in any enclosed area or within home appliances and industrial machinery of various types. Technically, the thermostats are generally comprised of a simple on / off switch that activates when a particular internal sensor detects a temperature change (in technical jargon called “temperature differential”), which is also turning on or off of the heating. There are different types of thermostats on the market designed to suit the needs of users, their operation varies greatly depending on the internal components and technology used in the construction phase. 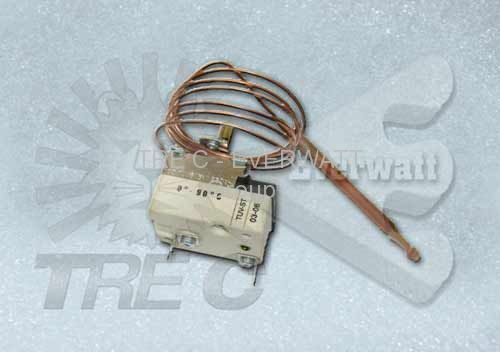 In the large type thermostats commonly found on the market, the thermostats can be divided into two main groups: mechanical thermostats (or analog) and thermostats electric (or electronic). In general, however, within the “mechanically-operated thermostats” is a fluid or foil sensitive to temperature change and which determines the switching on and off the thermostat itself. In the “thermostat, electrically operated”, however, the charge sensor to detect temperature changes is called a “resistor” and is installed in an electrical circuit that determines the start and shut down the thermostat when the temperature changes. Turning the thermostat, then causes the switching on or off the heating system is connected to the home. With the advent of “digital thermostats,” much more advanced than those above mentioned are, however, possible multiple temperature settings. Bimetal thermostat bulb rigid rod (single) – type with scale adjustment standard temperature 0-90 ° C, typical models for water heaters installed on the heating elements (such “RT” – see link), is available in version control that security with fixed switching (“cut-out”). Bimetal thermostats with capillary bulb (single and three phase) – we have in standard phase-type scale of temperature control 0-40 ° C, 0-90 ° C, or with larger hysteresis adjustment with scale: 0-120 ° C, 90-210 ° C, 70-300 ° C, typically installed on the heating elements with threaded or flanged resistors and batteries of electric heating air. All models shown are of thermostats available in both CD “Adjustment” and “security” scale 90-110 ° C, with a fixed switching point (“cut-out”). Of specific customer or, where alternatives need to control temperature, we can provide separately or included with the heater, thermometers, thermostats and other models with different temperature ranges. 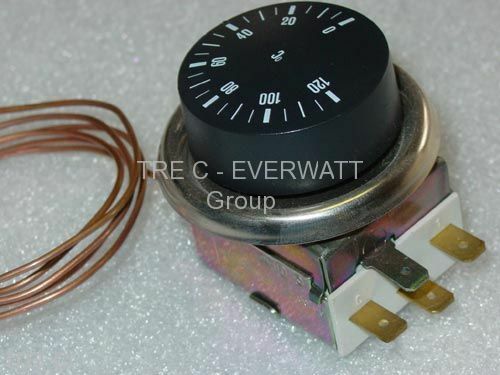 Our thermostats and temperature control devices are available in stock for immediate delivery in various types of standards in our stores, according to family (analog and digital thermometers, bimetal thermostats, thermostat bulb drive or capillary bulb thermostats), and adjustment scale standard voltage.